Iphone will be officially launched tomorrow night in the USA. 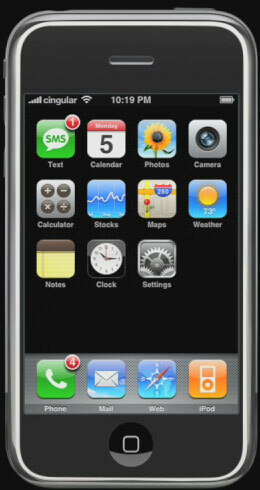 The The Apple iPhone is not just a phone – it is a phone, music player, video player, internet device, and camera all in one. Steve Jobs has such confidence in the new iPhone that he said he wants to sell over 10 million of them. The phone is expected to come out in Europe in the fourth QTR and Asia in 2008 and it will be available exclusively on AT&T for $499 on a two-year contract for the 4GB version and $599 for the 8GB version.The phone has been so widely mediatised that as usual, before the launching of the product, there is already a queue outside the stores. Some unemployed even proposed to queue for USD 250 dollars. There are endless possibilities to make money in Uncle Sam’s land..
Radioplus launched its web site recently and one can hear the programme live. Another innovation which was brought to my attention was the possibility of live viewing the animators of radio+ on mobile phones. This option was made possible with the collaboration of cellplus. However one need to have a media player configured on the phone. Despite what mamie clown said that one could view the show on a phone with an integrated camera, this is not quite true. Some phones with cameras could not access this feature. To access this feature, you need to send the following msg “wap make and model” to 8224. Afterwards you will receive configuration settings which you will need to save. Now you are ready to view the animateurs chouchou. A colleague of mine sms nokia 5500i to 8224. Guess what he received in reply.. “Incorrect or unknow phone model” . It seems that the local operator’s database is quite limited in the number of phones in circulation in Mauritius. I guess that it too can not control the quantities and models entering and leaving the country. But still, as a local operator i guess that tech wise, it could be ahead otherwise it could be divested. However since the local market is limited in the number of cellular operators, it could afford to lag behind and it is up to the customers to follow the tortoise. This is not new and cellular users need to stay tune, most of the times holding a two sided lighted candle and waiting for technological developments in the local telecommunications field to be able to maximise the use of their mobile phones. MMS and recently blackberry are such examples. Are we really trying to become a cyber island offering value added services when ADSL communications are unavailable for more than three consecutive days in certain parts of the island and technicians do not know the cause, or technicians threatening appalled users when they report them??? Lol!!! After trying nth times to dload bleach 68-69, i finally gave up. So i surfed on bbc site and happened to fall on an article concerning “cheating the search engines“. It’s about how search engines prioritise your search when you type in a phrase. Then they talked about an issue concerning manipulation of the biggest search engines and explain how it cropped up. Just learn from the papers that MT ADSL users from PL are having connection problems. Apparenly the PL servers are suffering from breakdown and all connections are being rerouted to Rose Hill. Vista presentation which was supposed to be launched on the 7th March 2007 has been postponed because the roof ofÂ Swami Veekenanda has been blown off by the powerful gusts of Gamede.Â Highly financed conference centre blown off by 140km per hour gusts!!! You are currently browsing the archives for the Technology, IT category.